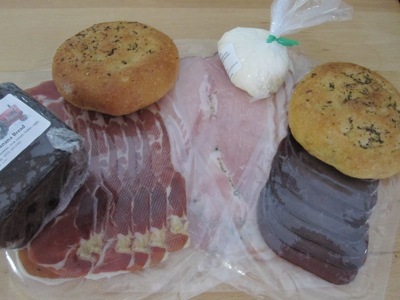 I also bought more chocolate banana bread, some fresh mozzarella, miniature focaccia buns, and some cured meat from Capone’s Market: serrano ham, prosciutto cotto, and bresaola. The bread, cheese, and prosciutto are already gone, converted into a perfect lunch. Let’s hope it cools down soon, I’m feeling carnivorous. This entry was posted in food & cooking and tagged food, local, market. Bookmark the permalink.